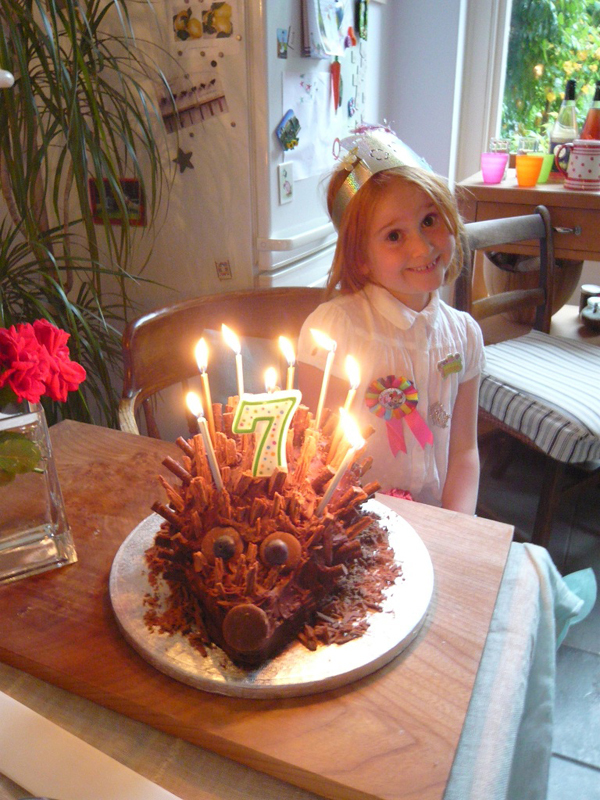 My niece turns seven today – I love this picture of her little beaming face with the crazy hedgehog birthday cake made by my sister Hettie. 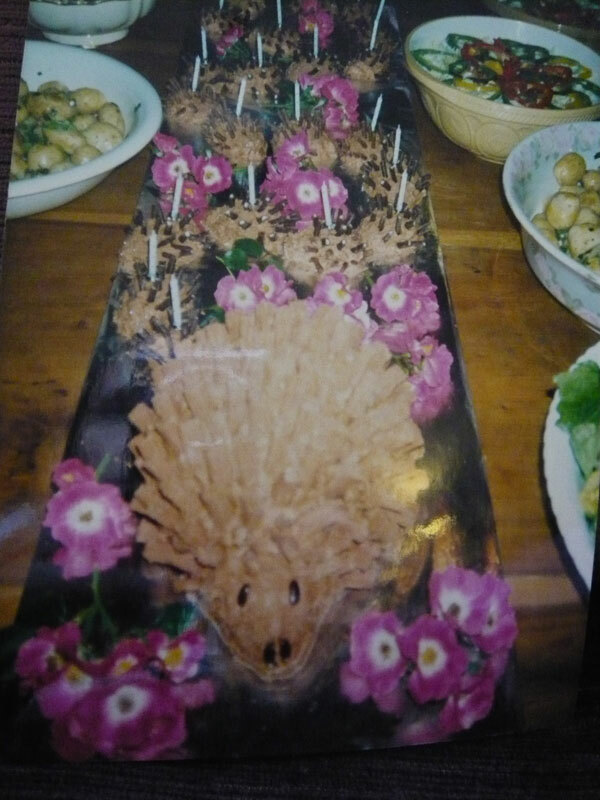 My sister, Hettie, reminded me that I had made the cake for her 21st – a large hedgehog cake with lots of little baby hedgehogs in a line behind. I have no recollection of this cake or making it – so she sent me a photograph – still no memory! Can you see all the baby hedgehogs behind? Were there really 21 babies? From the candles in each one I would say yes! July 11 1991 – and I really made this cake for my sister? Love the English roses scattered along the giant cake board. I have made many cakes – from birthday bunnies, dinosaurs and Harajuku Lovers to pink hearts and rose bud cupcake wedding cakes – and now I can add hedgehogs to my repertoire! 1. Preheat the over to 350 F. Grease two cake tins. 6. Divide cake batter into the two cake tins and bake in the middle of the oven for 15 – 20 minutes, until the cakes have puffed up and the tops are dry. 7. Transfer to a rack and cool completely. Chocolate prickles: You will need Cadbury Flake Chocolate Bars for the prickles on the big cake and smaller chocolate covered sticks for the babies – Glico Chocolate Pocky would work well or these Chocolate Sticks would also work but are a little pricey – although you do get 80 – so enough for lots and lots of baby hedgehogs! For Hettie’s 21st cake it looks like I used chocolate mint matchsticks for the babies – these are hard to find in America but easily obtainable in the UK. Chocolate buttons or chocolate chips for eyes and nose. 4. Spread across the top of the body of the hedgehog cake in a thin layer and carefully work to the edges and down the sides and over the nose. 5. Place the prickles into the frosting leaving the nose to pock out prickle free and add the chocolate buttons for the eyes and nose. Make up two round chocolate cakes for the big hedgehog – sandwich together with a smaller layer of buttercream frosting. With a large knife shape them into a mound for the body and use a triangle for the nose at the front. Cover the whole hog – sorry couldn’t resist! – with chocolate butter-cream frosting and then insert the flakes or chocolate sticks all over for prickles. Use chocolate buttons for the eyes and nose – or as Hettie did for Elsie’s cake little round cookies – I rather like his expression – matches Elsie’s! Make up however many batches of cupcakes you require for babies – there are 12 babies a batch – when cooled, remove cupcake case, slice off the top, invert cake on the cakeboard and use cake top to form the nose. Cover with buttercream and add prickles and eyes and nose. The video ‘Lick the Drip’ that we made is an example of how not to decorate your hedgehogs!